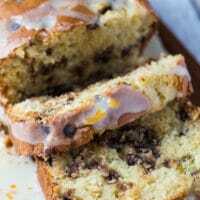 Glazed Chocolate Chip Orange Bread – Sweet, moist and tender orange bread studded with chocolate chips, and drizzled with an orange glaze! 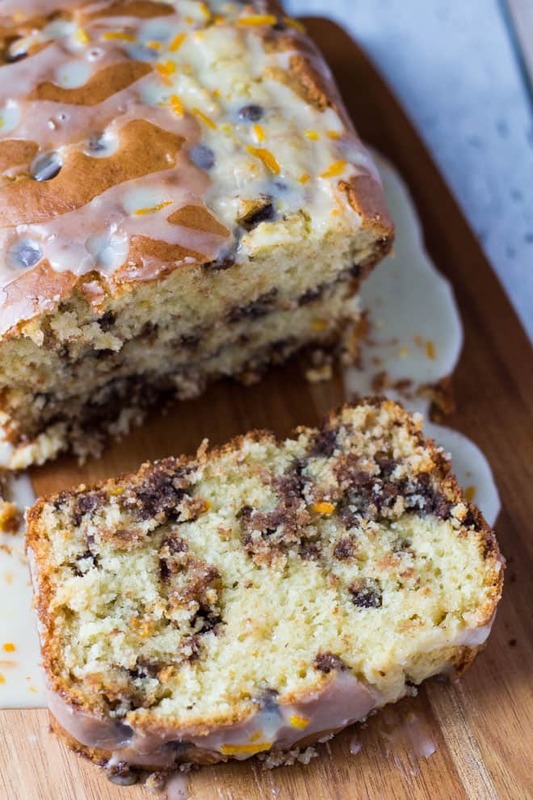 Fancy some chocolate chip orange bread drizzled with orange glaze for breakfast? I have the perfect recipe for you. I used my favourite bread/muffin base recipe, it is my go-to, and never fails me. The ingredients that make my bread so moist, and tender? Oil, and buttermilk. While butter gives unbeatable flavour in recipes, it cannot beat the moisture that oil brings. With the flavours of the chocolate chips, orange juice, zest, and glaze, you won’t miss the butter! Try not to substitute the buttermilk with anything. It is an absolute MUST if you want a super moist, and tender crumb! If you can’t get hold of buttermilk, simply add a tablespoon of white vinegar, and 1 cup (240ml) of milk to a measuring jug, leave for 5 – 10 minutes, then you have yourself homemade buttermilk! This recipe is so quick, and easy to make, you just combine the dry ingredients in one bowl, combine the wet ingredients in another, then mix the two together, bake, and done! A sweet, and delicious orange loaf ready to devour for breakfast, or any time of the day! More bread recipes to try next! 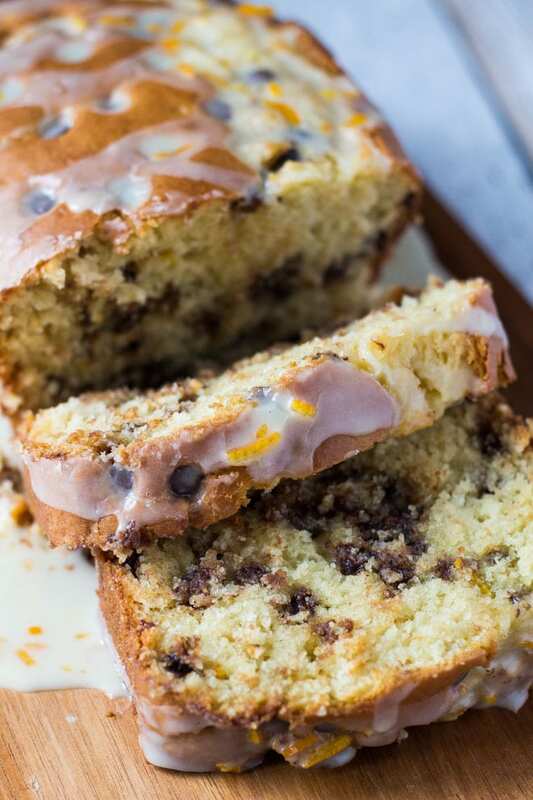 Sweet, moist and tender orange bread studded with chocolate chips, and drizzled with an orange glaze! Preheat the oven to 180C/350F/Gas 4. Line the bottom of an 9x5" loaf pan with baking paper, and grease the sides. Set aside. Whisk together the flour, sugar, baking powder, baking soda, salt orange zest, and chocolate chips. Whisk together the egg, orange juice, buttermilk, and oil. Pour the wet ingredients into the dry ingredients, and mix until just combined. Do not over-mix. Pour the batter into the prepared pan, sprinkle the extra chocolate chips on top, and bake for 50 - 60 minutes, or until a toothpick inserted into the centre comes out clean. Cover loosely with aluminium foil halfway through baking to prevent the bread from browning too much. Allow to cool completely in the pan on a wire rack before removing and glazing. Whisk together the icing sugar, and orange juice. Add more orange juice, depending on how thick you'd like the glaze. Whisk in the orange zest, then drizzle over the cooled bread. Yum! This combination sounds SO GOOD! I love using buttermilk in my baked goods – really makes things so moist. 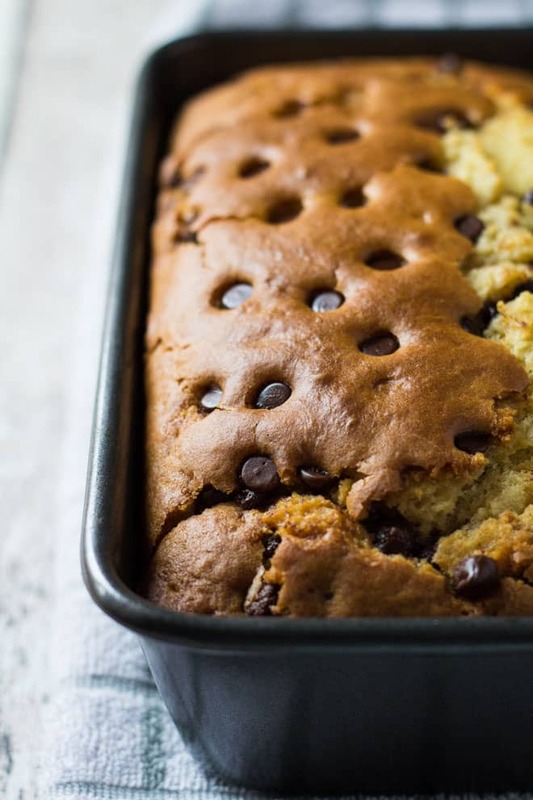 Chocolate chip orange bread for breakfast? YES please!! Loving that you used buttermilk in here! Serious moist and deliciousness going on! And that glaze?! I could guzzle that up! Cheers, my dear! Your photos are beautiful! 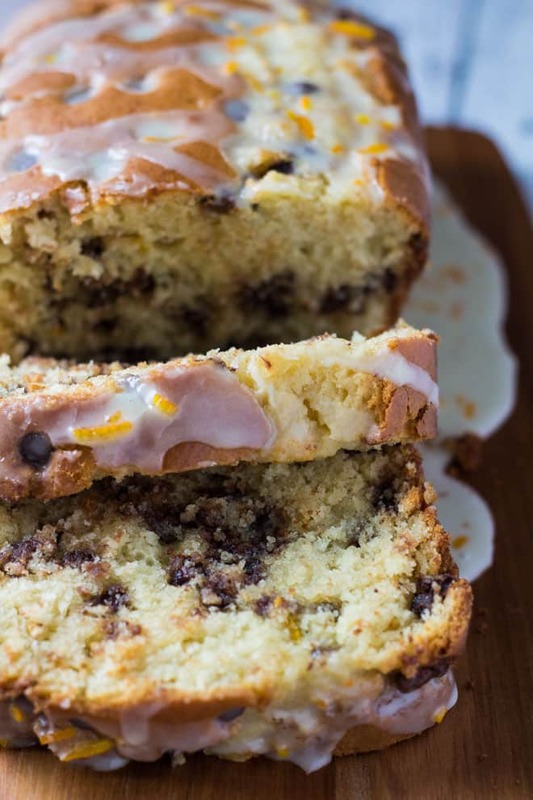 I love orange bread and this one looks especially good with the added chocolate chips! Orange and chocolate is such a yummy combination! I’m also a big fan of buttermilk in baking. Ah, I just love the specks of orange zest in and on top of the bread! I can almost smell that lovely fragrance through the screen! What a delicious combo, Marsha. I agree, buttermilk is a must in breads like these..and with chocolate chips too! YUM, must try this recipe soon! YUM!!! Can not wait to try this! Gorgeous photos, Marsha! I love all those chocolate chips scattered throughout the bread- looks so tasty! Do you know if I can make ahead and freeze? What a terrific recipe! My daughter and I were inspired by a segment on the Great British baking show and went online to find a new quick bread recipe. We spotted yours and since I love the combination of chocolate and orange it we gave it a try. I followed the recipe almost exactly (I added a bit of vanilla because I’m crazy about vanilla) and it came out perfectly – both in taste and texture. As you said, buttermilk really is key to achieving the wonderful texture. We served it along with a mango-flavored black tea to company and everyone enthusiastically asked for seconds. It’s a keeper! Thank you. Thanks, Tasha! I’m so glad you liked it!